The rebellious sheep of Red Eye Rodeo Co. were downright cantankerous Wednesday night in the first Days of the Old West rodeo performance at Hailey Rodeo Arena. The wooly animals named Steel Wool, Mutton Jeff, Eat More Chicken, Say No to Cotton and Better Sweater all bucked off their youngsters during the pre-rodeo mutton bustin' fun. 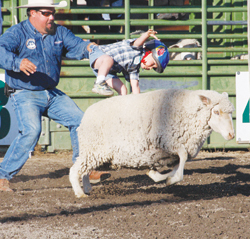 Then Ethan Shoemaker, 5, a future Sawtooth Ranger, came out of the chute and showed his mutton mettle. Ethan stayed aboard halfway to The Hitchrack on the back of Tic Hotel before eating dirt and getting a big hug from his father Trent (left) and Shelley Shoemaker. Showing up the boys and winning the contest with a clinging-to-the-cotton 88-point ride was Kodi Giron, 7, of Kuna. Father, sons ride across U.S.
What’s your vision for an arts center?